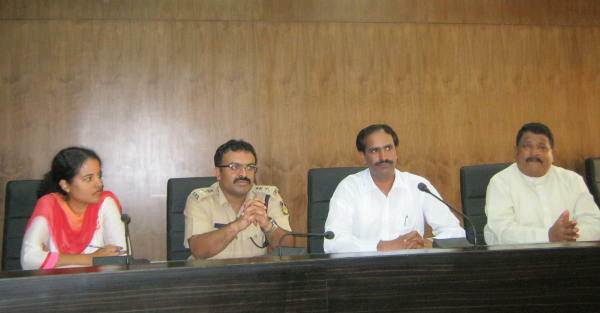 In a meeting held today of the DC Jayram, SP Chanbdragupta, Corporation comissioner Priyanka Francis and Head of Ganesh utsav Mahamandal MLA Sambhaji Patil it was deiced that the 379 Sarvajanik(Public) pandals can take permission from a single window system from 5 locations. Corporation has been asked to fill the potholes on all the major streets before the festival. As there is a heavy influx of people to see the Ganesh idols in night, Vegetrain hotels will be permitted to operate upto midnight and MLA Patil suggested that Liquor shops be closed by 8 PM. DC Jayaram further said emphasis must be given to have an eco friendly Ganesh festival and the use of Dolby must be banned during the immersion procession.